Banbury Harriers hosted the penultimate round of the Oxford Mail Cross Country League at Bo Peep Farm, Adderbury. The runners were greeted with freezing temperatures, but were undeterred by the weather and produced some good races. A huge thank you must go to the marshalls who stood out on the course for a number of hours. The combined U15/U17 mens race provided the best Harriers result of the day with Skip Snelson coming home in first place, Daniel Roberts in third and Simon Daenen 20th giving the boys second team place overall. Snelson took the race out early on and seemed to make light of the frozen, rutted ground. Alexander Pennington from Abingdon AC went with him, and Roberts hung onto the leading pair. Snelson increased his lead throughout the race and was never really threatened by the chasing runners, and looked very comfortable in taking the win by 13 seconds from Pennington, with Roberts a further 11 seconds behind. Second place seemed to be the theme of the day for a number of Harriers as Mollie Davis, in the first race of the day, came home in second place in the under 9’s race. 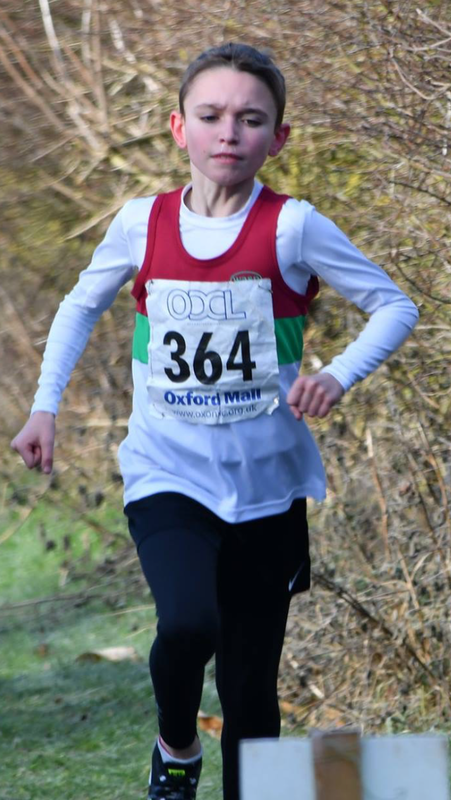 U11 girl Isla McGowan was also second, just 13 seconds behind Isabella Haines-Gray of Oxford City. In the same race Charlotte Hall was 8th of the 46 runners. In the U11 boys race Richie Mack had his best result of the season. Sitting in 3rd place for much of the race Mack produced a great sprint finish to claim second place by just one second. Tilly Lainchbury, in her 3rd race in a very busy week, was also pleased with her second place finish, and with Rosie Brand in 17th and Freya Pamphlett 19th they were awarded 3rd team on the day for the U13 Girls. In the combined U15/U17 girls race it was good to see Alex Scrivener back racing after a 6 month break, and showing her competitive spirit she worked hard throughout to finish 3rd of the U17 girls. Reuben Trotter, racing with the senior men showed consistent strength over the 8km course and was rewarded with 11thplace overall, and first U20 man home.